If you have a single collectible golf ball, chances are you want it displayed because A) you hit a hole in one, or B) it’s a signed or tournament-used ball from a golf professional and it deserves a special place apart from all the rest. In either case, you don’t want it to go in with your regular golf ball collection. You want something unique, perhaps something customized, just for this ball. We’ve scoured the web to find the 13 best golf ball displays for a single collectible golf ball. Some are hole in one ball displays, others are more generic and can be used for a great round, a signed piece, a tourney-used ball, and more. Do you have a large collection? Check out our roundup of the 10 Best Golf Ball Displays for Collectible Golf Balls. You’ll find something there no matter how large or small your collection is. Additionally, we have included a spread of premium, mid-range, and low-end products to suit whatever your budget may be. This means that several of these will be the best displays for a single collectible golf ball in a given price range. We’re also intentionally featuring a variety of different styles – wall mounted, desktop, wood, acrylic, personalized, hole-in-one theme, golf ball only, ball plus scorecard, etc – so that you get the best of the best in terms of choice, style, features, and functionality. Our hope is that this list is of service to you! 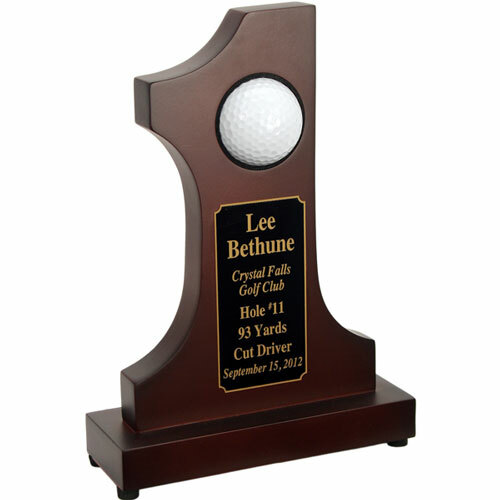 This wooden golf ball display plaque is made in the USA from gorgeous wood with your choice of premium finish. Includes a place for the single golf ball, a scorecard or photo, and is personalized with custom embroidery of name, date, and golf course. 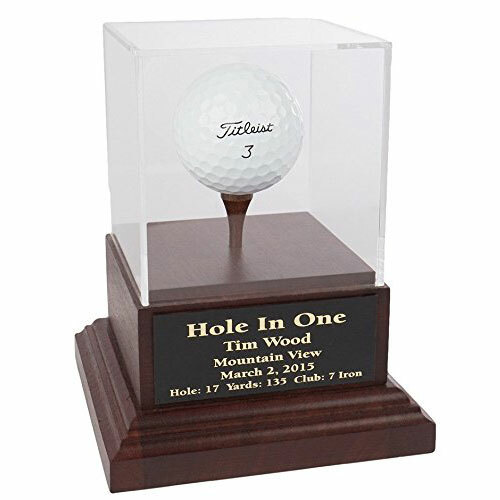 The number 1 is also included, to signify the hole in one; however, this display can easily be used for a #1 champion ball. At Northwest Gifts, we’ve been offering this same display for over 17 years, and it’s a proven winner. 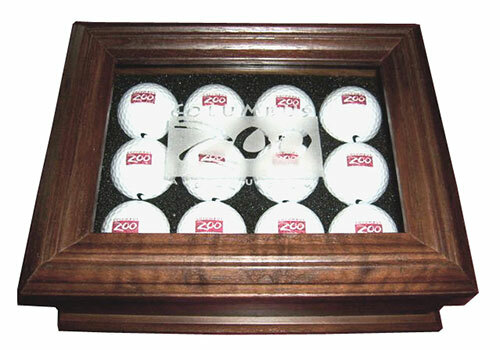 Our most popular golf ball display for a single collectible golf ball. Custom laser engraved in a fun yet classy vintage style, this wooden plaque is handcrafted in Oregon from durable and beautiful wood. 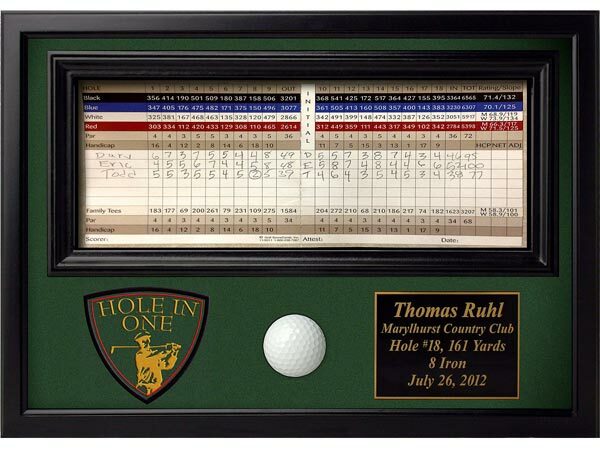 The dark-stained frame contrasts perfectly with the lighter surface area, which gets etched with your name, the date of your hole-in-one, and other details like the hole number, yardage, club used, and name of the golf course. For the golf ball itself, a little wooden shelf in wood that matches the frame. There’s a little divot to hold the ball in place, and with it in the center of the plaque this piece will be a conversation starter for years to come. Also available in several other engraving designs, including contemporary crossed clubs and elegant script fonts. 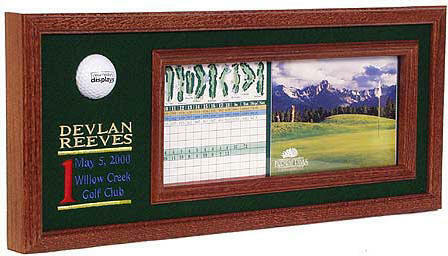 The Memorable Moments plaque is our most versatile display for a single collectible golf ball. It’s affordable, customizable, and it’s not limited to just a hole in one commemoration. 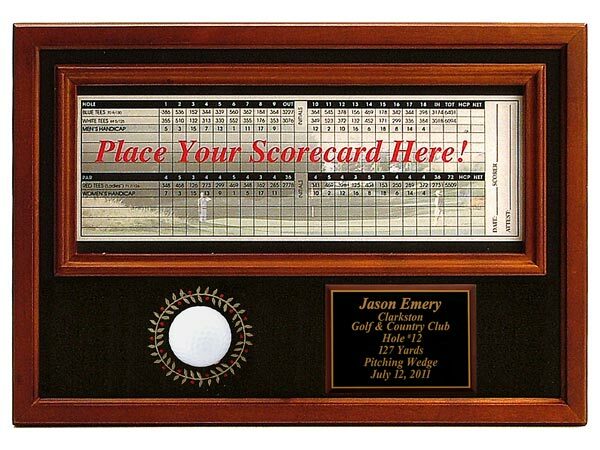 The scorecard frame measures 6″ x 8″, and can be used not only for a scorecard but also a photo, signed placard, printed commemorative text, newspaper clipping, or anything else you might want to frame. 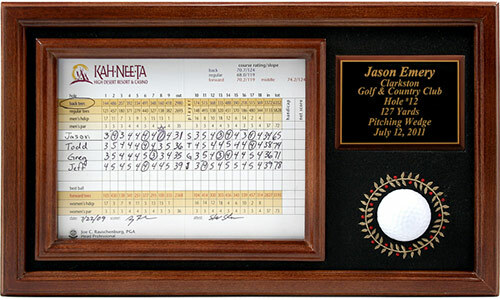 See below for the Memorable Moments display with a 4″ x 12″ scorecard frame. Most significantly, above the ball is a small engraved plaque set onto a wooden block that you can customize with the details of your memorable moment. Whether it’s a hole in one, a round with your favorite player or at your favorite course, an unbelievable eagle, or a special round with great friends, you can engrave just about anything you like onto the display. The Hole in One Display with Crest is similar to the Memorable Moments plaque, but with a few key differences. First, it features an elegant and contemporary black finish. Second, it has a gorgeous “Hole in One” crest as one of the prominent features. And third, it just comes off as sleek, classy, and modern. The hole in one crest does limit this one to showcasing your hole in one ball. But if you’ve accomplished this coveted feat, this is what you want. Arrives ready for display with saw-toothed hangers to mount on the wall of your office, den, or man cave. This display is exactly like the Memorable Moments (#2, above), but instead of holding a 6″ x 8″ scorecard it is designed with a 4″ x 12″ frame. 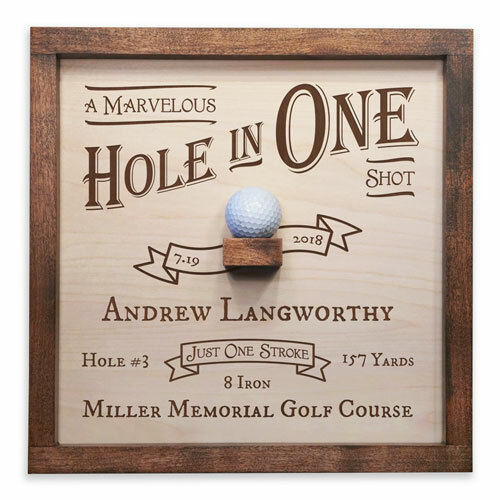 It includes custom engraving and there is no “hole in one” verbiage, so you can add that onto the engraved plaque if you want, or you can list any other details you like. Arrives ready to hang, holds a single collectible golf ball and includes free laser engraved personalization. The features that set this display apart are the unique combination of clear glass case with wood frame, a sense of simple elegance, and mid-range affordability. 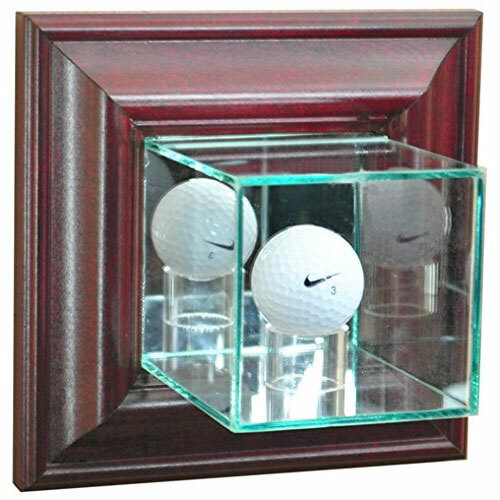 This single golf ball display is made to order in the USA with 50% UV protected, double strength glass and mirror and accented with furniture grade cherry moulding. The mirror helps accent your trophy golf ball, which can be accessed through the hinged top for easy access. Real glass and a lovely cherry finish make this the ideal display for simplicity and elegance. Arrives ready to hang. This little beauty has long been one of our favorites. 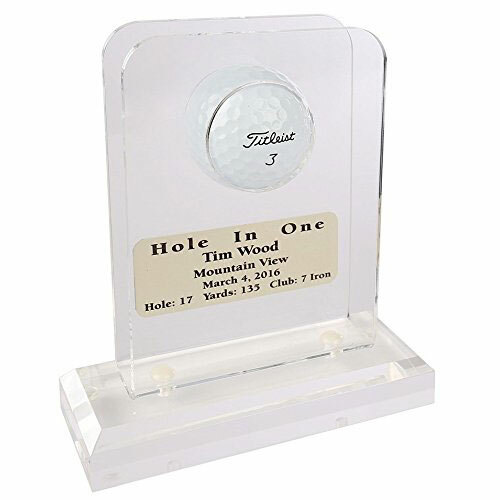 The unique design – shaped like the number one to convey the number of strokes on your scorecard for that hole – combines with a simple presentation of the golf ball and the details of your hole in one shot for a gorgeous and affordable display. Features include furniture grade wood with Rosewood finish, personalization of any details you care to list (that will reasonably fit) on the name plate, and a secure indent to hold and showcase your golf ball. This one isn’t necessarily limited to a hole in one. Again, the plate can be engraved with any details you like, so this can be for a #1 championship round, a personal best score, a collectible ball from your #1 favorite golfer or the #1 golfer in the world, etc. Use your imagination! Pricing may vary, but for about fifteen bucks or so you can get this nice quality, well-reviewed, imported display for a single collectible golf ball. The acrylic outer shell protects the ball from UV damage, and the clear acrylic ring helps steady the ball keeping it securely in place. The wooden frame base is MDF with cherry finish and includes a mirror to reflect and enhance the ball display. The top cover lifts off for interior access. There is space on the flat area to add a personalized name plate, but this is not included, keeping the cost down for you. A simple and affordable choice that is accessible to all and still looks rather nice. The mid-range option for a small desktop or shelf display. This simple wooden box boasts a compact size, rosewood finish, hinged lid, personalized engraved nameplate, and space for a single collectible golf ball. Commemorate a hole in one or any other golf treasure with this elegant and space-conserving keepsake box. This desktop golf ball display stand is similar in style to #7 on this list, but has the bona fides to demand the premium price tag. The display itself is miles above in terms of quality and overall presentation. Made with American Walnut and finished by hand with a cherry stain, this unit includes personalized engraving on the nameplate. 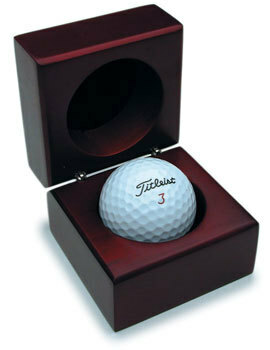 The ball is held in place by an elegant wooden tee, and the acrylic cover is crisp and perfectly constructed. 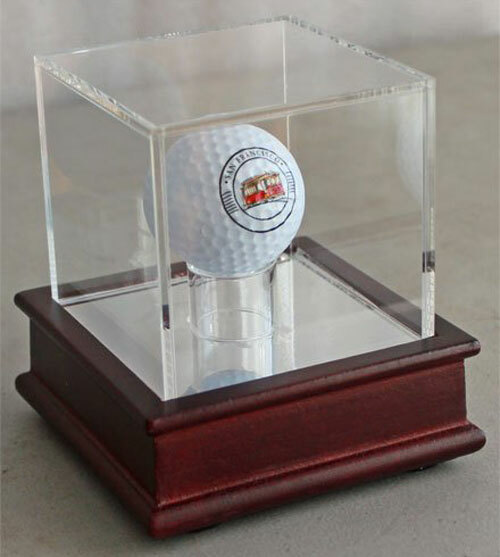 A gorgeous yet understated personalized desktop display case for a single collectible golf ball. This American-made keepsake box is one of our flagship products at Northwest Gifts. Popular configurations and uses include a sports championship ring box for 1-20 collectible rings, a commemorative keepsake box for retirements, graduations, and other special occasions (includes engraved name plate and a frame-style insert lid for photos), and even a custom memorial keepsake box to honor the memory and mementos of a loved one. Each of these are the same beautiful wooden box with different options or inserts. Here, however, is our less-well-known version. This one is used for collectible golf balls. Shown above with the maximum of twelve balls, we can customize the insert to hold just one or up to a dozen collectible golf balls. The box is made from gorgeous solid walnut wood, features an elegant hinged lid with real glass and customized laser engraved personalization on the lid. For additional customization, you can add a name plate to the front by selecting options on the product page. A truly beautiful heirloom choice to display a genuine collectible treasure. For a more corporate look, this clear acrylic golf ball display showcases the single collectible golf ball and includes custom laser etching on the name plate. The reviews are solid 5-stars, the size and price are definite mid-range, the style is simple and understated yet elegant. Made in the USA from solid oak, this rustic and understated frame holds both a scorecard and a single golf ball, which makes it ideal for a hole in one, best round, or commemorative round display. Includes your choice of basic ball display or ball on tee, a wide range of scorecard sizes, and your choice of etched phrase on the side including hole in one, best round, 19th hole, 1st flight, and more. Last but not…. well, ok, probably least. This acrylic cube is four bucks and change, and it holds a single golf ball. Nothing more really to say about it other than that it does a great job protecting your collectible golf ball from dust, decay, UV, and damage, while remaining visible and only setting you back a few dollars. 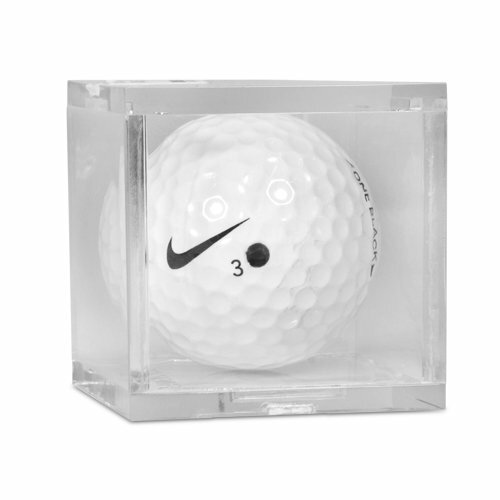 It’s simply the best single collectible golf ball display in its price range.